Use seedlings that can be cultivated from a bulb, or sow to their regular spot in the garden in early spring. At least 30 cm (12 in) between rows and at least 10 cm (4 in) between the plants in a row. To grow young onions, plant them in line one beside the other. Approximately 15 plants per person. Plant for seedlings in January; the seeds outside at the end of March (when the soil reaches at least 3 °C / 37 °F), and the bulbs end of April. Sow the seeds of winter varieties in August and the bulbs end of September. Onions grow at min. 7 °C (44 °F), optimum temperatures being around 20 °C (68 °F). They germinate in two to three weeks. Do not fertilize. Keep the soil soft. Onions need a lot of moisture when they are getting thick. Water twice a week to 15 cm (6 in) deep. Use organic mulch. Zucchini, kohlrabi, carrots, parsley, cucumbers, tomato, parsnip, beetroot, lettuce, strawberries, anis, dill, chamomile, potato, radicchio. Beans, peas, broad beans, chickpea, Brussels sprout, cauliflower, black radish, chives, garlic, leek, Chinese cabbage, Savoy cabbage, cabbage. Onion fly, thrips. Set adhesive fly boards near and when the first flies get caught, cover the onions tightly (with arches above the plants). Keep the soil soft and the right distance between rows. Do not plant in the same place for at least five years. Do not fertilize with nitrogen or barn manure. When the first leaves lay down and the onion stem gets soft, it is the right time for storage. Pull the onions out together with leaves, bind into bunches and dry. Store in a dry place, put in net bags or hang. The bulbs. The bulbs and the roots of young onions. They contain a lot of essential oils and antioxidants. 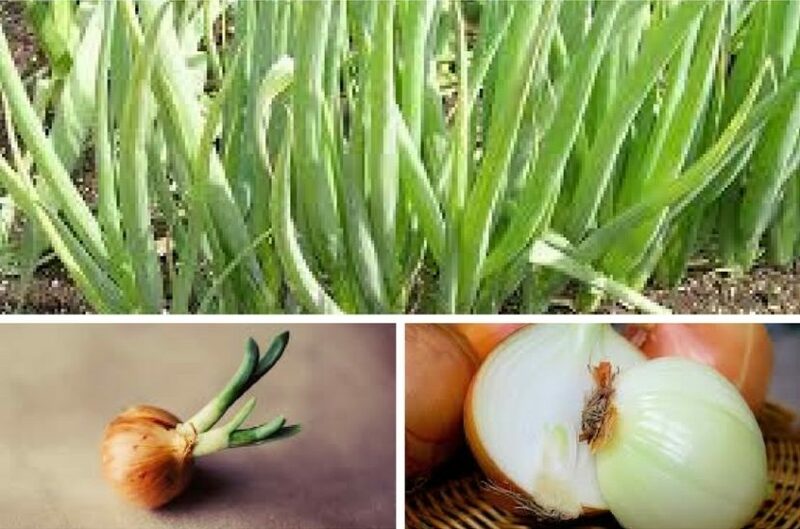 Onions depend on the length of the day – in short days they develop roots; in long days leaves are forming. Therefore, the last date for planting is end of March. Onion decreases blood sugar and cholesterol levels, and clears the blood. It is the basic ingredient of many dishes. The peels can be used as a natural coloring for Easter eggs.